Project Roundup 3! Today I've got another bunch of great AlterKnit projects to share with you. Giveaways are complete, but you can still read the reviews and blog posts listed below. Quince & Co. hosted me as a guest on their blog to share a behind-the-scenes look at how Sean and I created AlterKnit. 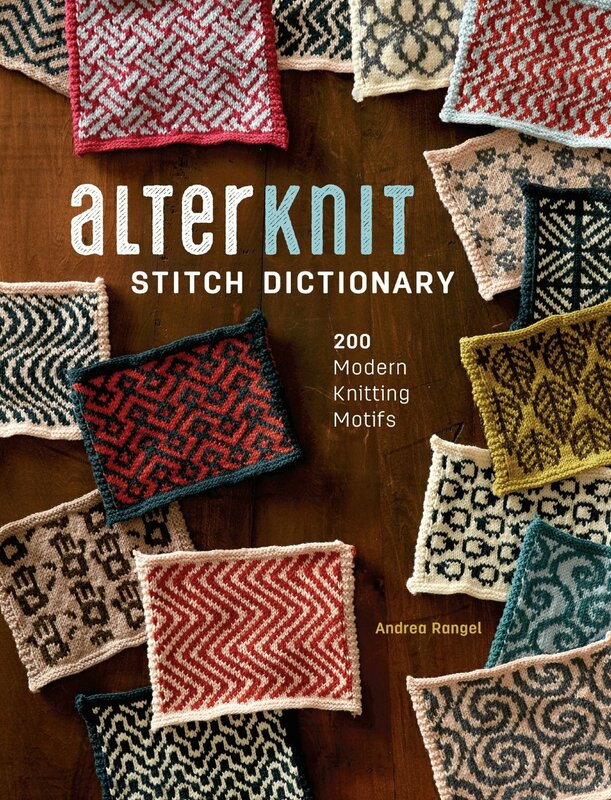 They're also giving away two skeins of Finch, the yarn I used for the swatches in the book, and a copy of AlterKnit! Hurry because you only have this weekend to enter! Stephannie Tallent wrote a review and is hosting a giveaway on her blog, ending Dec. 11, 2017. Shannon Cook's giveaway is over, but you can still read her AlterKnit review on her blog. Starting at the top left, Escher Fish swatch from karenjkaye, Spiders double knit swatch and cowl from margaretisabellamcc, Helix Cowl from Saski on Ravelry, Jaunt Tote Bag (using the Ascend motif) from Spout Knits (this pattern is available for purchase! ), Flame Mittens (a clever modification of the Deep Ocean Mittens using the Flames & Heat motifs) from KYFarmgirl on Ravlery (knit by her 14-yr old daughter, wow! ), Bikey Beanie Hats featuring the Elephant and Monkey motifs (I couldn't fit it in the collage, but there's also a Poopin' Pigs hat, so click on the link to see it!) from nosmallfeet on Ravelry, Large Colorwork Pumpkin (a pattern you can buy!) from Knit Equals Joy Designs on Ravelry, Bees Hat from skyebekah, and History swatch from curious_tinker. And just to be sure you noticed, the Jaunt Tote Bag by Spout Knits and the Large Colorwork Pumpkin by Knit Equals Joy are both patterns you can buy, so check them out! P.S. If you've already got your copy, I would so appreciate a review on Amazon even if you didn't buy it there. Reviews really help books get seen. Thank you!